Rudy Giuliani, former New York City mayor and current lawyer for President Trump, speaks to members of the media during a White House Sports and Fitness Day last month. Giuliani suggested Friday that presidential pardons could be given to people caught up in the Mueller investigation. The blunt remarks came the same day that Manafort was ordered to jail amid allegations of witness tampering. Manafort is facing charges including alleged money laundering, tax evasion and conspiracy stemming from Mueller's investigation into Russia's attempts to influence the 2016 presidential election and whether the Trump campaign and associates were involved. Trump himself tweeted that Manafort's treatment was "Very unfair!" The comments from Giuliani, the freewheeling former New York City mayor whose unscripted comments have caused the White House headaches since he joined the Trump legal team, are the clearest signal yet that Trump would consider pardoning his associates swept up in the Mueller probe — which could make them more reluctant to cooperate with investigators and raise questions of whether Trump is abusing his pardon power to obstruct justice. Giuliani later told CNN that he wasn't suggesting that the president should pardon anyone in the near-term, but that there was historical precedent for pardons once an investigation is done. Giuliani citing pardons issued by President Ford for those involved in Watergate, those issued by the first President Bush for those involved in Iran-Contra, by President Clinton in the Whitewater case, and others. 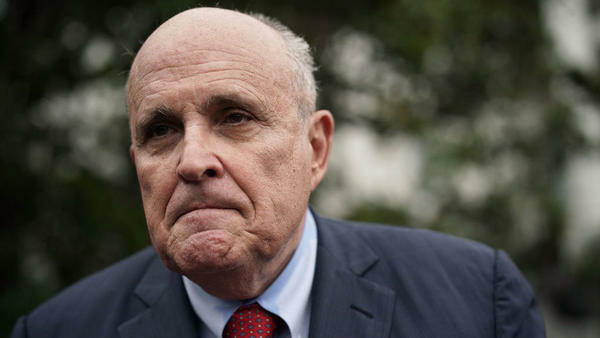 "Let me make it clear, right now, anybody listening," Giuliani told CNN's Chris Cuomo, "He is not going to pardon anybody in this investigation. But he is not, obviously, going to give up his right to pardon if a miscarriage of justice is presented to him after the investigation is over." Giulini also denied that Trump was trying to send a message by suggesting pardons for those who could potentially testify against him. Trump was asked Friday morning by reporters about the possibility of pardons, and he demurred. "I don't want to talk about that. No, I don't want to talk about that," the president responded — though he did say "I do want to see people treated fairly." Trump has embraced using his pardon power, giving clemency to celebrities and controversial political figures. But to use it for political allies in such a potential way would be new legal ground. Constitutional scholar Cass Sunstein told NPR's Nina Totenberg last year that the Founding Fathers believed abusing the pardon power would, indeed, be an impeachable offense. "If the president counsels crimes personally or participates in a crime personally," Sunstein said, "and then exercises the pardon power so as to shelter the people who engaged in those crimes, the Virginia debate is very clear. That is an impeachable offense." Other legal scholars say that while Trump could wield his pardon power in this way, it would be hard to prove intent to obstruct justice by pardoning his friends and aides — for instance, if he were to pardon his former national security adviser Michael Flynn, who has pleaded guilty to lying to the FBI and is now cooperating with Mueller. "If Trump were to do that, Flynn could not avoid testifying by invoking his right not to incriminate himself. But without potential charges hanging over his head, what would prevent him from lying?" Totenberg reported last July. And it's not just Manafort and Flynn who could be up for potential pardons — Trump's former personal lawyer Michael Cohen decided to separate from his attorney on Wednesday, and some reports suggest that he is considering cooperating with federal investigators in New York. Trump on Friday told reporters, "I always liked Michael Cohen. I haven't spoken to Michael in a long time." He added that he is not worried about Cohen cooperating because Trump says he himself has done nothing wrong. It's also unclear whom Mueller's probe could reach next — perhaps even Trump's own children. Another idea the president and Giuliani have discussed is whether Trump could pardon himself in the context of the Mueller probe. "As has been stated by numerous legal scholars, I have the absolute right to PARDON myself, but why would I do that when I have done nothing wrong?" Trump tweeted earlier this month. That pre-emptive defense came after Giuliani said on ABC's This Week that Trump "has no intention of pardoning himself, but he probably — not to say he can't." "I think the political ramifications would be tough. Pardoning other people is one thing; pardoning yourself is tough."